Fun Beach Activities for Adults - That Dont Cost you A Penny! Fun beach activities for adults. Fun beach activities for Adults – The weather is warming up and the sun is telling you that you need to go to the beach and why the heck not? There is always something that pulls you to the beach whether its the water, swimming or just soaking up the sun. But what happens sometimes is that you just find yourself lying they’re running out of a conversation or reading a book. If you have a group of adults and don’t have any kids then let us do some fun beach activities for Adults. The beach games on this list require imagination, some music and whatever you can use and people willing to play and have fun. 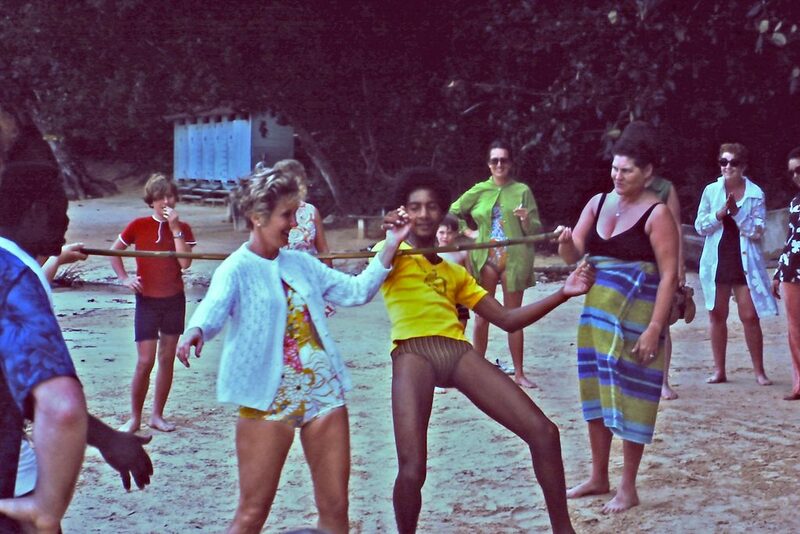 Fun Beach Activities for Adults – Tug of war! 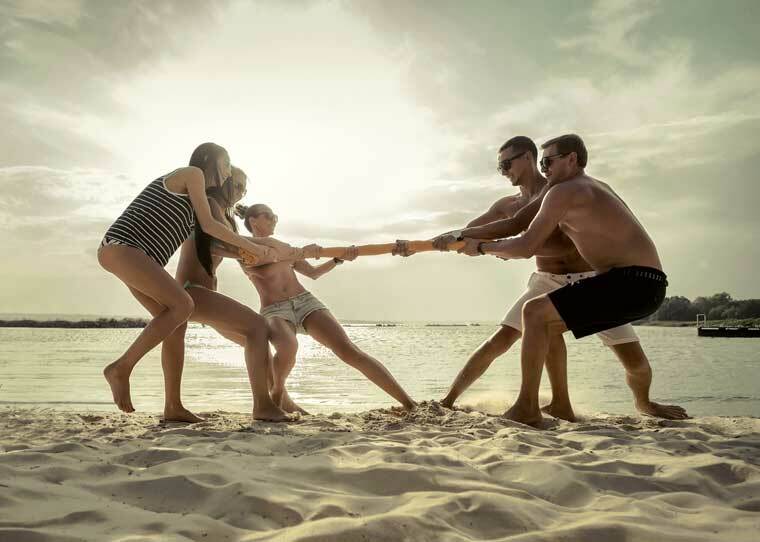 Everybody loves to play tug of war and why not play it on the beach! You properly didn’t take any rope with you so we’re going to use a big beach towel. Wet if you can. Mark a line on the sand, have either 1 to 2 persons either end and the object of the game is to try and pull each other across the line. The winner is the person or persons that do this. The simple and easy game that is fun and you might get a bit of sweat working up. To start with our list and to look stupid but having some fun is a bit of an energetic game especially for people who don’t like losing. This game is a lot like Musical Chairs but we are going to use beach blankets instead. So put the towels out in a line for each player but take away just one. You know the score by now, we are going to put a bit of music on and all the players are going to dance around the towels naked (just kidding) and when the music stops, the either have to stand or jump on the towels. The last one to do it is out. Then the next round you take another towel away and so forth until there is only one winner! Simple and entertaining fun for either 2 to 4 players, Draw a big dartboard on the beach and make sure you can put the points in each column. Draw a big scoreboard next to it. Do not use real darts for this game as obviously, you might kill someone. use of stones or rocks or even shells. 3 at a time. Draw a line for where you can throw from and play Big Game Darts on the beach. You can play 501,301, killer, cricket. The list is almost endless with a dartboard and this game is great for getting an all over suntan and it is low energy game as well. Well, there would be no reason why Beach Limbo is not on this list, A simple and fun game that everybody can play Naked (just kidding again). Grab a large beach towel or sticks or something that represents a bar. Put some soothing music on, Get 2 people to hold this bar either end and people have to bend down backwards dancing under the bar one at a time. After everybody has a go the bar is lowered about an inch at a time and they all go again. This keeps going until people touch the bar and then you are out! The winner is the one that’s left who hasn’t touched to the bar. You can even spice it up a bit with a shot of alcohol after every turn. This is a great fun game as adults will be doing stupid stuff in front of everybody else and can be quite embarrassing. you need a few tennis balls and a marker before the game starts-every one will write on the tennis balls stupid ideas like “Run backwards singing Elvis” or “Hop on One Foot” or “Sit Down, Stand up” With As many tennis balls packed with stupid dares, You get one tennis ball at a time. Stand in a circle and just play catch until someone drops the ball. When they drop the ball, whatever dare is nearest the top, they have to perform it for 30 seconds. When you have performed all of the first tennis balls dare, move onto the next tennis ball. This is such a fun game, especially if the dares are very embarrassing. 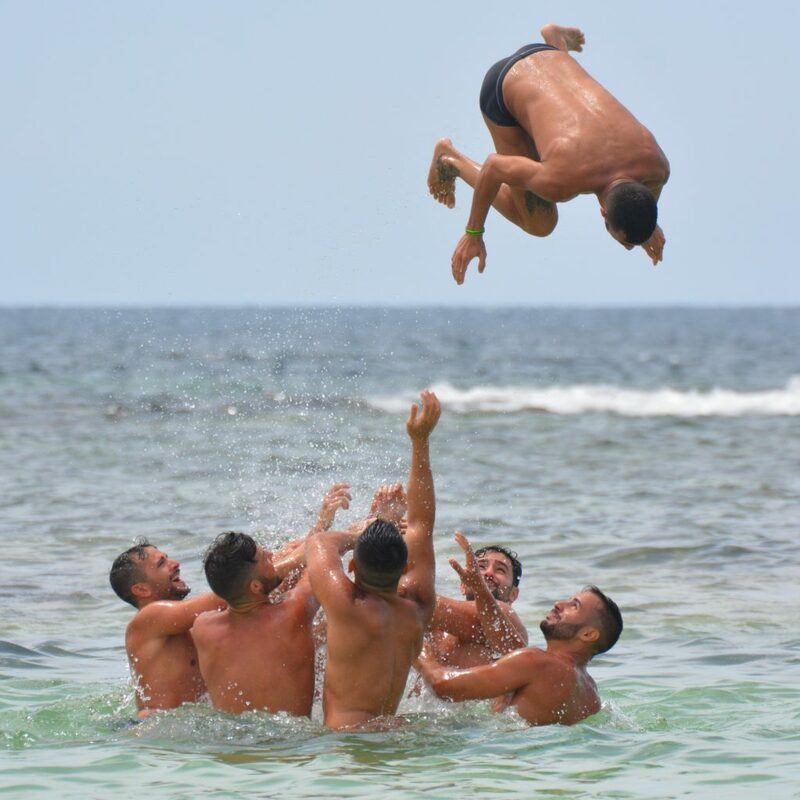 that’s our list of fun beach activities for Adults and hope you get winning all the games above, they are fun and simple and will keep you entertained in your groups! If you got any adult games that you play on the beach we would love to hear from you so comment below and explain how you Play it! Also, Remember games can be fun and they can be dangerous if you’re not aware of people around you. Stay Safe at the beach and watch yourselves and others.